Packed with blooming color! 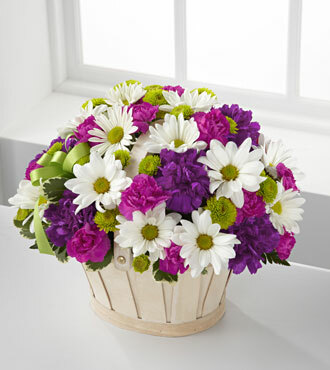 The FTD® Blooming Bounty™ Bouquet is a bountiful blend of hot pink carnations, green button spray chrysanthemums, white daisies and purple carnations in a pretty white-washed reusable basket. A decorative green bow makes it ideal for any occasion. Send this bountiful basket with your free personalized gift message to say Happy Birthday to a friend, co-worker or family member. Our optional added gifts like a box of chocolates, a delightful stuffed bear and a brightly colored Mylar balloon will make this floral gift the ultimate surprise.